Thematic designs in embroidery are really no new thing, right? You’ve got Day-of-the-Week towels, Nursery Rhyme quilt blocks, State Birds, State Flowers, and so on and so forth – all developed into embroidery designs over the years. But I want to tell you a story about another thematic line of embroidery, available online, and for free! Once upon a time, a little girl sat on the stool outside her cottage, bent over her handwork. Along a came a fox (yes, that’s the bad guy – for some reason, the fox is always the bad guy!) who tempted her away from her work, telling her about the grapes he couldn’t reach over in the vineyard, and that he insisted were sour anyway. As the little girl walked toward the vineyard, a mouse skittered by her feet, holding a spinter between its tiny mouse teeth! “Yikes! A mouse!” cried the little girl. But the mouse was nothing compared to the lion that was lumbering away in the other direction, limping slightly from some sligh foot infection undoubtedly caused by the splinter that just skittered by. The light girl was mighty glad the lion didn’t see her. She continued toward the vineyard, neglecting her embroidery left on the stoop outside the cottage door. Naughty girl! Arriving at the vineyard with the beguiling fox beside her, the little girl reached up for a bunch of grapes. The cunning fox licked his lips, knowing that finally, those grapes would be within his reach! Yum! Grapes! The girl plucked one from the bunch, popped it in her mouth, simultaneously holding out some for the fox, who gobbled a few in a gulp. And simultaneously, they both started sputtering. With her worst sour face, the dismayed little girl returned to her stoop in front of the cottage door, with every intention of picking up her handwork and plying her needle diligently. At that moment, though, the rooster (there’s always a rooster!) perched himself on the edge of the thatched cottage roof, right above the stoop upon which rested the little girl’s beautiful handwork. With all his rooster might, the bird began to crow. As the little girl approached the stoop, the rooster stopped his infernal crowing, paused, and then did what roosters and chickens so readily do at any given opportunity. Splat! Right on the embroidery. He then strutted away. The moral of the story is… Well, there are numerous morals, some of which I’m sure are too deep to attempt drawing out here! Fables are brief stories involving the personification of animals and ending with a clear moral. Aesop’s fables are the most famous fables in Western literary tradition, and they’ve been re-told and re-written and illustrated in numerous books down the centuries. Now, how does this all tie in with needlework? Well, how about embroidered fables, in cutwork? Sure enough, at Antique Pattern Library, there’s a terrific illustrated book of fables, and the illustrations are —- wait for it! —- cutwork patterns! Really and truly! 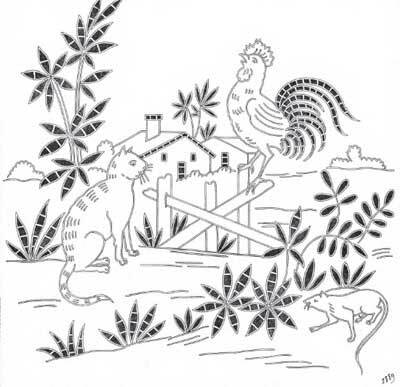 In its 73-page PDF, the book, an edition of Broderies & Ouvrages de Dames titled “Les Fables de La Fontaine,” includes the illustration of the fable by way of an embroidery pattern, followed by a translation in English of the fable illustrated. It’s entertaining to read and the pictures are perfect for illustrative embroidery. Don’t think they’re limited to cutwork, either! You can easily turn the designs into regular surface embroidery projects! So stop by Antique Pattern Library and brush up on your fables while perusing the patterns presented in this fun little book! And if the books sparks any creative ideas, drop back by and let the rest of us know! Thar's a yarn fer sure…. I just started quilting and have always wanted to learn embroidery as well. You have inspired me to go shopping this weekend for some supplies! Your work is beautiful, and, after watching 5 of your videos, I feel like I can actually do it! Thank you so much for posting these – I will be a frequent visitor! Hope you are enjoying your travels and getting lots of new ideas to share with those of us who are stuck at home! I really like the antique library and so glad that you show us different book in it. The fables are great, and I can't wait to try something with the monkey. Thanks again for your blogs, I look forward each day to my e-mail. Before I just check it once a month or so. Happy trails and safe journey. My first time commenting on your site. Love this little story and also how the cutwork has been incorporated into the drawing. I too would like to see some more on cutwork. Thank you for interesting reading. This is really nice piece of art. In fact my theses is about the representation of embroideries in Palestinian literature. Fable tales are helpful thanks for the flash idea. Next Next post: Taveling Travails – Not a Chance to Stitch!